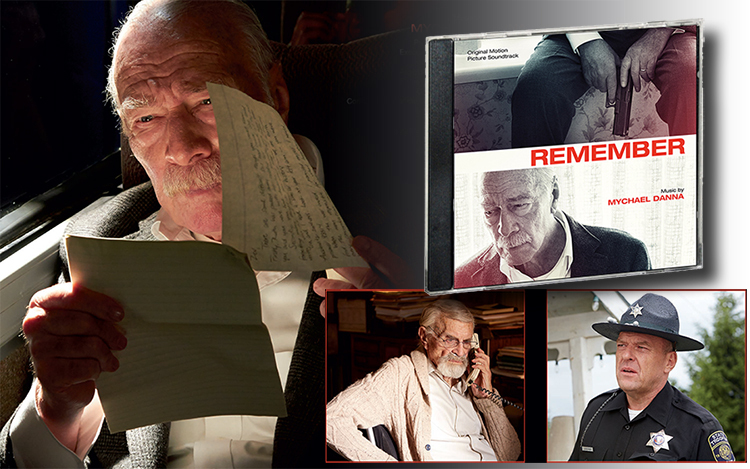 Varèse Sarabande will release the Remember – Original Motion Picture Soundtrack digitally and on CD January 15, 2016. The album features the original music composed by Mychael Danna (LIFE OF PI, CAPOTE, THE GOOD DINOSAUR). Mychael Danna is an Academy Award®-winning film composer recognized for his evocative blending of non-western traditions with orchestral and electronic music. Among his body of work includes his Oscar-winning score for Ang Lee’s LIFE OF PI and his many Genie Award-winning scores for director and longtime collaborator Atom Egoyan. Danna has scored a majority of Egoyan’s films including ARARAT (2002), FELICIA’S JOURNEY (1999), THE SWEET HEREAFTER (1997) and EXOTICA (1994) secured him Genie awards from the Academy of Canadian Cinema & Television; as did his score for Deepa Mehta’s Oscar-nominated film WATER (2005). Danna received the 2013 Golden Globe and 2013 Oscar for scoring Ang Lee’s LIFE OF PI, following his collaborations with Lee on THE ICE STORM (1997) and RIDE WITH THE DEVIL (1999). Recently, Danna’s credits also include the Oscar-winning LITTLE MISS SUNSHINE (2006), for which he shared a Grammy Award nomination for Best Compilation Soundtrack Album; Marc Webb’s acclaimed romantic comedy 500 DAYS OF SUMMER (2009); and James Mangold’s Oscar-winning film GIRL, INTERRUPTED (1999). Most recently, Mychael worked with his brother Jeff Danna on the score for Disney/Pixar’s THE GOOD DINOSAUR and received an Annie nomination for Outstanding Musical Achievement in an Animated Feature Production. The Danna brothers collaborate on multiple projects, including the music for the FX original series TYRANT. With his vast knowledge and experience as a composter, REMEMBER was another unique and compelling film to add to his resume. REMEMBER is a thriller in which the darkest chapter of modern history collides with a contemporary mission of revenge. Christopher Plummer plays a man suffering from dementia and living in a nursing home in a frequent state of confusion. He is reminded by of his haunting memories during the holocaust, which causes him to hatch a plan to hunt down the man who killed his family, but his unreliable memory and unclear plan make it a difficult journey.